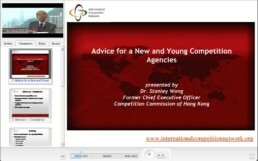 This presentation by Dr. Stanley Wong focuses on bolstering the capacity of new and young competition agencies, including the conduct of advocacy, staff training, and the use of guidelines. Modules are available in several formats. Interactive format allows for navigation between scenes, contains links to relevant materials, and includes a quiz. Downloadable format is the same as interactive, but allows the reader to download the module to a local computer, which reduces uploading delays. You Tube format includes the same substantive content as other formats, but also lacks the interactive features. Viewers are encouraged to use the format that works best for them.